The Resource Development International - Cambodia (RDIC) ceramic water filter is a low-cost solution for filtering water for communities who otherwise do not have access to safe drinking water. Using local materials and manufacturing methods RDI makes and distributes water filters throughout Cambodia. RDI also makes available in-depth technical information about how to construct and install a ceramic filtration system for approximately $10 US dollars using locally available materials. This system is especially valuable in areas where electricity is not available or where minimal understanding of germs and water born illness is prevalent. A specially constructed clay/ceramic pot is placed inside the top of a large water storage container. Contaminated water is poured into the ceramic pot. As the water seeps through the porous pot, nearly all of the impurities are removed. Pure drinkable water is collected in the large water container and immediately ready for consumption. This product is very inexpensive and easy to use. It removes all germs and bacteria from water, and works with both rainwater and surface water. The filter will purify 2 liters per hour. NB. This filter cannot remove arsenic, or other chemical contaminants from water. As a result, this is not a good device for arsenic contaminated well water. (Its best used in Cambodia for rain and surface water.) Not time efficient for purifying large quantities of water. 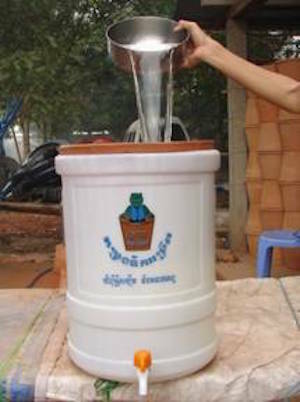 RDIC has been making ceramic water filters in Cambodia since 2003. RDIC’s operation started at a small scale as it developed its manufacturing techniques. By September 2007 RDIC had distributed approximately 60,000 filters throughout Cambodia, and internationally, with 24,000 produced in 2007. Ceramic water filters have proven to be tremendously effective in reducing the exposure of users to contaminated water, and the incidence diarrhea over an extended period of time (Brown and Sobsey, 2006). Field trials of the effectiveness of ceramic water filters in Cambodia over time showed a 46% reduction in diarrheal disease between filter users and non-users, a 95.1% average (and up to 99.99%) reduction of E.coli in drinking water (Brown and Sobsey, 2006). Laboratory testing has shown a 90-99% reduction in viruses (Brown, 2007). These results support other trials of ceramic water filters (Lantagne, 2001) as a highly successful means of empowering households to manage their own safe water supply. RDIC continues to invest significant time and energy into developing its processes and would like to share its knowledge and best practice approaches with organisations who wish to have a similarly positive impact on communities in developing countries.